The Institute of Divine Metaphysical Research was founded as a result of a divine vision and revelation, given to our founder Dr. Henry C. Kinley in the year 1930 in the state of Ohio. The school was incorporated in 1932 in Springfield, Ohio. The corporation moved to the state of California in the year 1958. This is a school, not a church nor are we affiliated with any religious organizations. At this school, we teach by the true and correct name of our Heavenly Father YAHWEH, ELOHIM, and YAHSHUA the messiah. You will find that there is no J in the Hebrew language to this day and there was not a J in any language prior the middle ages. For further explanation of the Name, please refer to the preface of the Holy Name Bible and any good encyclopedia or dictionary. Click here to view the Panoramic Chart. Yahweh is Spirit, and those that worship Him must worship in spirit and truth. YAHWEH is the source and substance of all there is and chose to manifest himself as a phenomenal cloud because a cloud has no particular shape and form. To describe the makeup of the cloud, he manifested nine major attributes, which are: Intelligence, Wisdom, Knowledge, Beauty, Love, Justice, Foundation, Power and Strength. 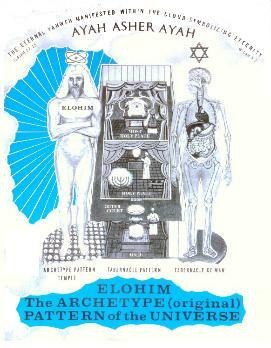 Yahweh took on a superincorporeal shape and form of a man without flesh, blood or bone known as Yahweh- Elohim, the Archetype (original) Pattern of the Universe. It was in this manifestation that he created the creation, both Angelic and Physical. Then, Yahweh-Elohim manifested in a specially prepared sacrificial body known as Adam, and Yahshua the messiah, in order to institute and fulfill the law and the prophets. Yahweh Elohim Yahshua. These three are one. As it states in Deut. 6:4 “Hear O Israel, Yahweh our Elohim is Yahweh a UNITY.” Everything you can see and cannot see lives, moves, and has its being in the pure spirit state of Yahweh.